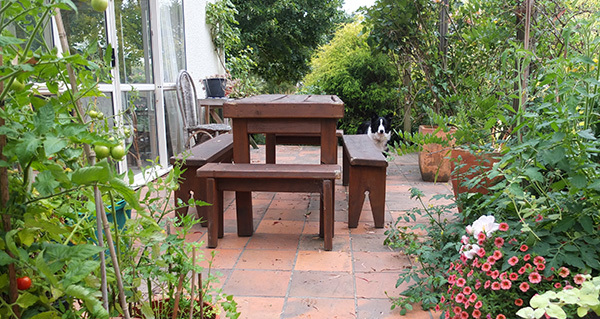 I use the house patios nearly all the year round - on spring mornings, for summer barbecues in the early evening, autumn coffee breaks - and in winter, when the sun is shining, sitting with a book and a cup of tea. Some days I just gaze and dream, or plan my next garden development. 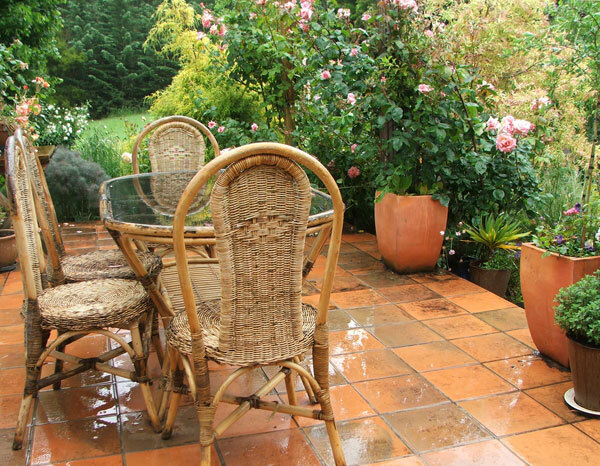 So the patio garden furniture stays outside all year round, and naturally needs to be able to cope with the rain and colder weather (hardy ever snow, though). The latest table and benches on the top patio are sturdy, and perfectly designed, as far as I'm concerned. I can sit heavily on one end of a bench without tipping up and over. Several corners were already dog-chewed bought, second hand - no problem. Young Winnie, the new Border collie, has already taken up the challenge. Oops. An earlier set of cane furniture has to be decommissioned a few years ago. I loved this look, and I particularly loved the price I paid for the glass-topped table and six seats - ten dollars! But natually the cane did not weather well, particularly in the rain. I knew that! The chairs were the first to collapse, luckily not with anybody sitting on them. It quickly became too hazardous to leave out on the patio. 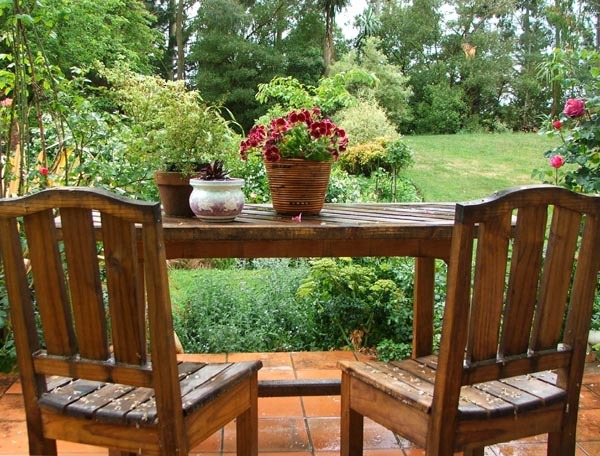 On the bottom patio sits a table and two chairs that Non-gardening Partner made for me. These are much loved, and well used. The table is perfect for cats snoozing in the afternoon sun - or keeping a sneaky feline eye on the bird feeders hanging above. Careful, birds! Delicate design and shimmering style - how else can I describe my special home-made wooden patio chairs and table? And so very well made, over two consecutive summer holidays. 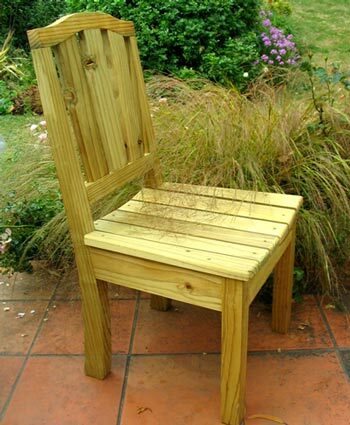 This photograph was taken when the first chair was brand new, before the wood was oiled. My very favourite gardening magazine is called Fine Gardening. Non-Gardening Partner has a subscription to Fine Woodworking, the sister (or brother?) magazine to mine, in which this garden furniture was featured. Hee hee - 'His and Hers' magazines! There's just one small thing. I know that chairs are extremely fiddly to construct, so perhaps that's why there are only two of them. I'd love to have a couple more. Still, there's usually only two of us!